I was looking at the photographs on the website of Atlanta's Fay Gold Gallery, and came across this picture by Bob Kolbrener. I immediately said, "Hey, I know that tree!" I ran to my bookshelf, pulled down Paula Chamlee's first monograph, Natural Connections, and turned to the last picture. 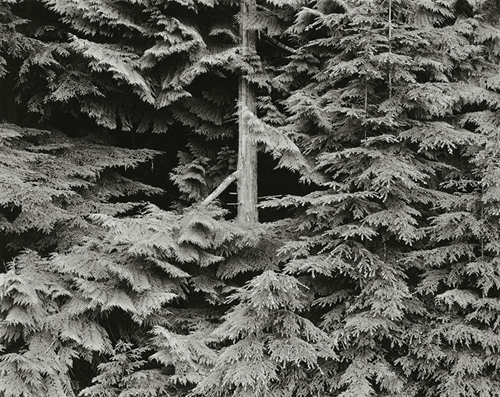 It is hard to be certain from the small, poor-quality scan from the Fay Gold website, but it looks to be exactly the same tree that Chamlee photographed in 1990— exactly ten years after Kolbrener's photograph was made. 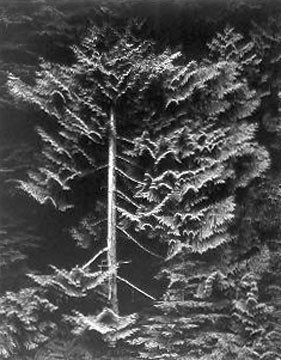 Even though it has been nearly 20 years since this tree was photographed by Paula Chamlee, I want to go to this place, Hurricane Ridge, Washington, to see if this tree still exists, and try to discover why two very different photographers would pick this one tree and make two very different and incredible photographs of it. I can't say which of these photographs I enjoy more (and I have to question whether or not I would have responded to Kolbrener's picture if I did not already know Chamlee's). It makes me wonder what other pictures of this tree exist.